Few people realize that Russia has one of the world's premier systems of protected areas, which preserves millions of acres of wild landscapes - important habitat for a vast number of plants and animals. Wild Russia is an international effort to document images of the wild nature harbored in Russia's system of strict nature reserves and national parks. Through the Wild Russia project, we aim to promote worldwide appreciation for Russia's vast network of protected areas and to increase understanding of the opportunities these areas offer for conserving the planet's biodiversity. Many of Russia's wild lands form part of a network of strictly protected scientific nature reserves called Zapovedniks (Zap-o-VED-nik), the highest category of nature conservation in the world (IUCN category I). The first Zapovednik, Barguzinsky, was created in 1916 on the eastern shore of Lake Baikal. Now, 101 Zapovedniks, covering more than 33.5 million hectares (82.7 million acres), protect diverse wilderness areas across the country. From the tundra in the far north to the steppe (prairies) in the south, from the Black Sea to the Bering Sea, these Zapovedniks cover a tremendous diversity of territory and play a critical role in nature conservation. In this web site you will have the opportunity to learn about the system of Russia's Zapovedniks, which was formerly united with similar Zapovedniks of Central Asia, Ukraine, Georgia, Moldova, and other former Soviet republics. 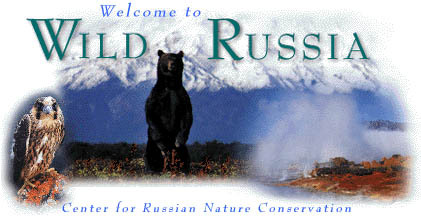 Russia also has a burgeoning system of National Parks, covering nearly seven million hectares (17 million acres). Although Russia has other types of protected areas such as Zakazniks (special purpose preserves) and Natural Monuments, this site focuses primarily on the Zapovednik and National Park systems. Begin your tour to Wild Russia to learn more about Russia's Zapovedniks and National Parks. This weekend, our dear friend and colleague Laura Williams died in a horse riding accident at her home in Russia. It is a great shock and devastating loss for her family, friends, the WWF family, and a global community of conservationists, equine trainers, conservation photographers, fellow writers and readers of her work. Laura squeezed an amazing amount of life into her 49 years. She was an ardent advocate for conservation, a writer, a rider and horse trainer, an entrepreneur, a mother, daughter, sister, wife, good friend to many. She loved her boys and family and her husband Igor. Laura, with her seemingly unflagging energy, fearlessness and skill in so many areas, must have hit the ground running when she was born. I met her in the early 1990’s, when she was in the process of establishing the first office for WWF in Russia. She, Eric Dinerstein and David Olson were compiling a compendium of information on Russia’s protected areas which would become the blueprint for WWF’s first decade in the country. Already by age 24, she was fluent in Russian and building a team for WWF in Moscow. Working with WWF offices in Europe and the US, Laura oversaw a major effort to get a desperately needed injection of funds into Russia’s zapovedniks, national parks, and endangered species protection. About a year later, Laura – along with Eugene Simonov – became the co-director of a $20 million grant from World Bank to the Russian Federation – the first Global Environmental Facility (GEF) grant to the country for biodiversity conservation. At the time, I was also in Russia, mostly in the Russian Far East and Karelia, working in Kostomuksha Zapovednik. As our friendship grew, we called each other “sestra” (sister) because of our same last name and overlapping connections in Russian conservation. It would also turn out that we would share the same boss: Bill Eichbaum, who hired her to open the WWF office in 1993, became my mentor and hired me at WWF six years later. Laura was not only a friend, but a creative sounding board and fellow strategist. She was the only other American I knew living in Russia interested in the protected natural areas of this daunting, fascinating and challenging place. Maybe it was not all that daunting to Laura, though. She managed to navigate the bureaucracies of Russian red tape and get money sent to various project sites across Russia – all at a time when the country’s financial system was in tatters, few people trusted the banking system and most individuals didn’t even have bank accounts. She organized field trips for WWF visitors, including one for Prince Philip to a Siberian nature reserve. She even drove a car in Moscow – that really impressed me! During this period, she met Igor Shpilenok, founder and then-director of Bryansky Les Zapovednik (Nature Reserve). Igor’s vision to build a public education center at the edge of the nature reserve captivated WWF’s (and Laura’s) interest, and won the confidence and a grant from WWF. He was among the first of zapovednik directors to understand how to build a public constituency for the country’s protected areas, and Laura, having grown up with several national parks in her “back yard” in Colorado, fully understood the value of such work. Igor set to work immediately on the project and a year later, Laura attended the ribbon-cutting ceremony for a new, modern and beautiful educational visitor center in Suzemka village. Later that day, just as Laura was boarding the train back to Moscow, Igor invited her to return to Bryansky Les to become the director of the center. Laura thought twice about leaving her job with WWF but not for long. She was called to the woods of Bryansk (and Igor may have had something to do with it) and decided to take Igor up on his offer. She loaded her clothes and two kittens into her little black Lada and drove 500 km south to Suzemka. After the big city life, settling into a simple log house with no running water or electricity must have been quite a change for Laura. And for the neighbors, too! The local babushki (elder women) found it fascinating to watch the young red-headed Amerikanka chopping her own wood for heat and carrying buckets of water on her own. The unusual appearance of this foreigner in these parts sparked a media frenzy and Laura’s story was broadcast nationwide: an American woman! living in such rustic conditions! by choice! But Laura kept focused on her work. Soon children’s programs were multiplying at the new center, local kids and adults were taking part in the Earth Day event March for Parks, and she was greeting a constant stream of visitors – rural school children, parents, regional officials, reporters – they were all welcome. Igor and Laura became a team in the field, and then in life. They fell madly in love with each other. Once when I was visiting them, Laura and I went for a long ride (she had at least two horses at that time) along the edge of the nature reserve. We came back at in the late afternoon. Igor was so happy to see her. “Let’s not ever be apart,” he said as he kissed her. It wasn’t long before they were married. Together they finished building a house in the rural country village of Chukraie. Initially Igor had laid a small square foundation, but when Laura came along, the house took on new, creative proportions and formed the center of what is now a real homestead in the remote Russian countryside. Igor stepped down from being the director of Bryansky Les Nature Reserve, and transitioned to the position of ranger, so he could spend more time doing wildlife photography. The two began traveling frequently to other nature reserves, and produced a series of articles on the wildlife and wild places of Russia’s nature reserve system. Laura spent a year in the United States, where she attended the Yale School of Forestry for a Master’s Degree program, studying wildlife biology and taking up writing more intensively with our mutual friend and professor Fred Strebeigh. about her life in Chukraie, and then in 2005 moved – with two small boys and Igor in tow - to Kamchatka for a stint with the United Nations Development Program to run the UNDP salmon program there. Here Igor began his explorations of Kamchatka, documenting the geology, landscapes and animal life of this wild region. In 2006, Laura returned to WWF. She helped us open an office in Kamchatka, the land of salmon, volcanoes, and brown bears. Laura earned a name for herself and WWF as staunch fighters on behalf wildlife, making it challenging for poachers to do their dirty business in certain parts of Kamchatka. The local authorities did not appreciate her earnest efforts, though, and tried their best to harass and intimidate her. In 2009, with her foundation of experience in Kamchatka, Laura then joined the staff at the Wild Salmon Center, based in Portland, OR. She took Andrei and Makar to the west coast for a year where they got their fill of English language and American culture. Igor kept busy back in Russia, spending more time in Kamchatka and preparing for his epic cross-country trip to document Russia’s nature reserve system in photography. In more recent years, Laura was focusing on a new direction: equine therapy for children and adults alike. Having grown up riding in Colorado, she loved horses and started to add more of them to her animal family in Chukraie. As with all of the other projects she took on, Laura threw herself into the research and hard work needed to train her horses. Last year she showed me some videos of her horses in action. In one scene, Laura is standing on a bench in the paddock, talking quietly to Daisy, an enormous, wide Percheron (“Budweiser horse”), standing several feet away. Laura instructs Daisy, who is wearing neither halter or saddle, to back up. Calmly, Daisy steps carefully backward until her huge body is parallel to the bench, now just inches away. Laura murmurs a thank-you to Daisy, and climbs onto the horse’s bare back. In another video clip, a young girl with cerebral palsy is in the paddock, grooming one of the horses as it stands statue-still. Then she gets a chance to lead the horse on her own. Imagine the confidence-building boost for the girl! I wish I could recount with more detail some of the other scenes, such as the tiny autistic boy reading in the paddock as horses wander around him, or the team-building exercises Laura is leading for a group of adults. They are laughing and having fun; that was evident. I loved and admired Laura, my American-Russian sestra. She had a unique mix of passion, humor, adventurous spirit, incredible competence and desire to do something good in the world for people and the planet. She had friends and colleagues around the world who recognized her creativity, commitment, intellect and depth. As much as one can write about such a person, words are never enough. In Laura’s memory, we can try our best to greet each day with intention, gratitude, and effort to make the world a better place. 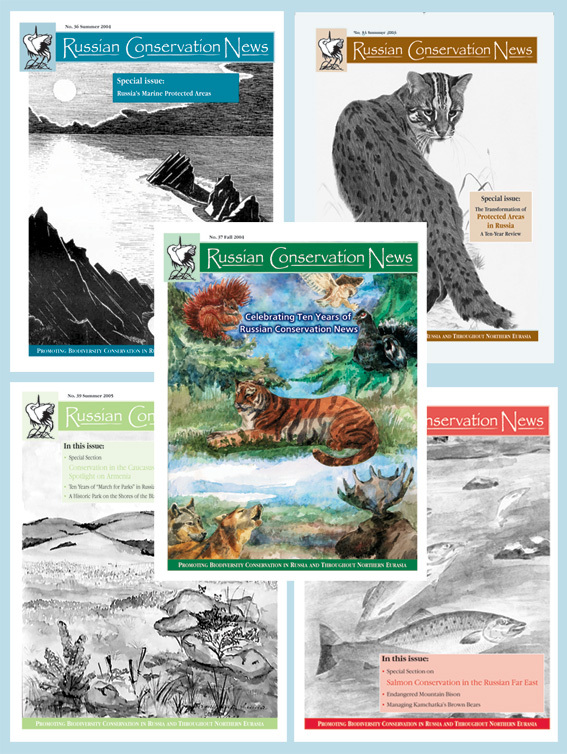 Free DOWNLOADS: the only English-language journal on conservation issues in Eurasia, published by the (former) Center for Russian Nature Conservation (RCN) since 1995. Click to learn more about RCN.